Nesbø fans, rejoice! Nesbø fans, rejoice! Today Jo Nesbø announced that he will release his twelfth Harry Hole novel in July 2019. (The countdown begins now!) Harry Hole #12 will be titled KNIFE, and will be on sale in July 2019. Suffice it to say, I couldn’t be more excited about this new installment in my all-time favorite crime series. 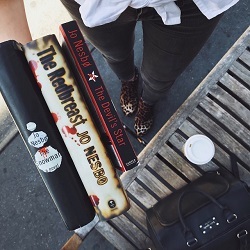 Read on for more information on KNIFE, and for links to CBTB’s Nesbø coverage! 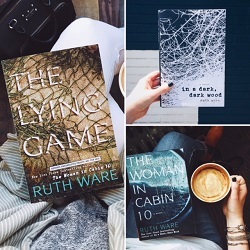 Breaking news: one of my favorite psychological thriller writers, Ruth Ware, has announced her next book! In Summer 2018, Ware’s THE DEATH OF MRS. WESTAWAY by Ruth Ware will release in both the US and UK, and it sounds absolutely fantastic. Ware has quickly become a staple of my personal crime fiction library and my list of go-to book recommendations, and THE DEATH OF MRS. WESTAWAY sounds (if it’s possible) even better than her previous three releases—and that’s saying a lot. Read on for more information about Ware’s forthcoming release, and for details on what exactly I’ve loved about Ware’s previous releases! Expect to see lots of talk about THE DEATH OF MRS. WESTAWAY here on Crime by the Book in 2018.